There are many different kinds of furnishings and accessories that can be used in designing a bathroom or formal powder bath. To name a few, there’s lounge chaises, benches, side chairs, accessories and other types of interesting decor pieces to consider when pulling together a bathroom space. Organization is crucial to having a functional bathroom and today there are many accessory-type objects out there that can pass as decorative (all while keeping you organized). 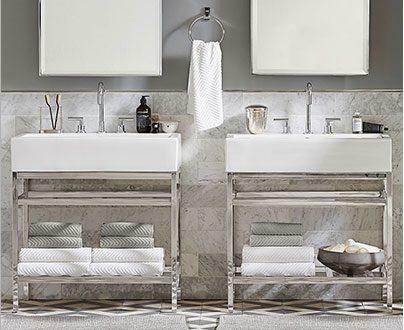 A horn or polished nickel tray to place your products on or even a large basket on the floor to hold your bath towels in are just a couple well-played ways to work off this practical yet modern design concept. Incorporating soft textures, such as terrycloth, into a bathroom is a nice way to bring comfort into a bath setting. There are a few ways to do this, whether it’s from a set of bath or hand towels or even an upholstered bench. 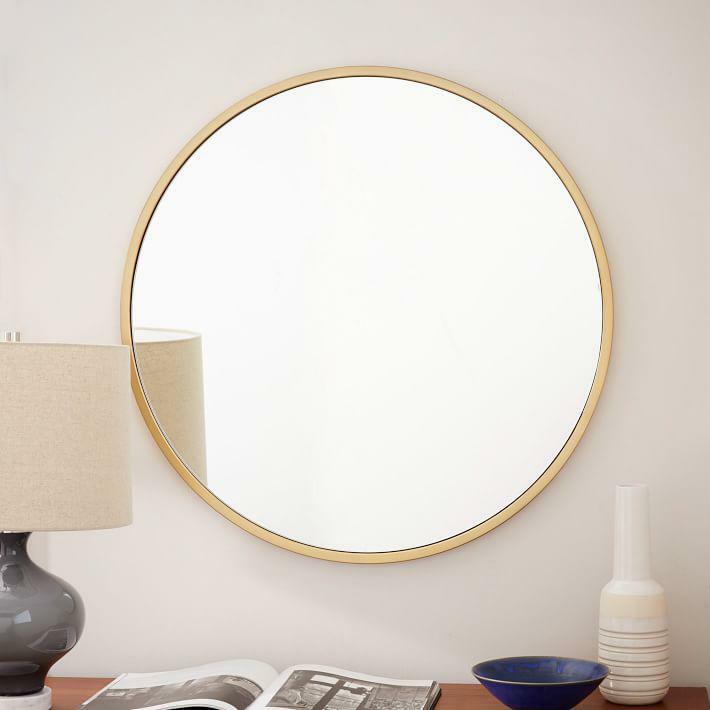 Today, there are also many washstand vanities and wall mirrors on the market that offer a custom-look at a ready-made price. In the world of bath design, get creative and mix it up. 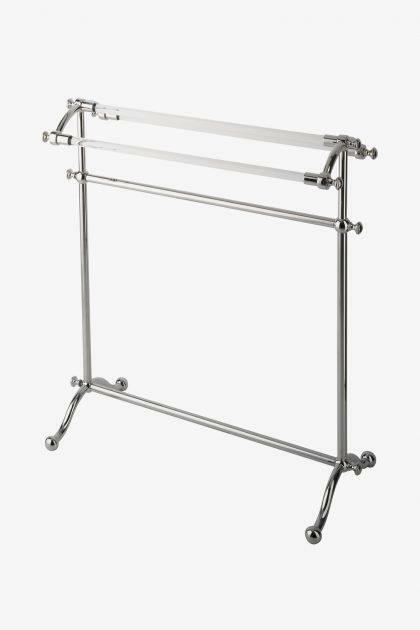 Available in many finishes, the Etoile Metal Towel Rack by Waterworks offers a sophisticated and sleek look all while being functional.Price: $2,589. 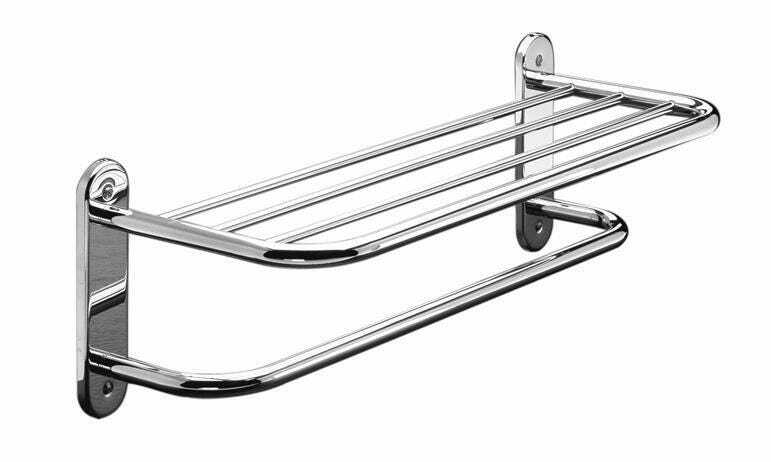 An elegant style, The “Prezlee” Towel Bar by Newport Brass at Ferguson Showrooms would work well in many different bathroom styles. Price: $85. 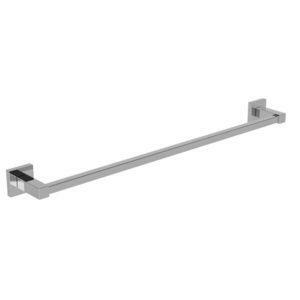 A nice way to display hand and bath towels, The Jumbo Hotel Wall Shelf by Wildon Home at Wayfair offers a fresh and modern look. Price: $57. 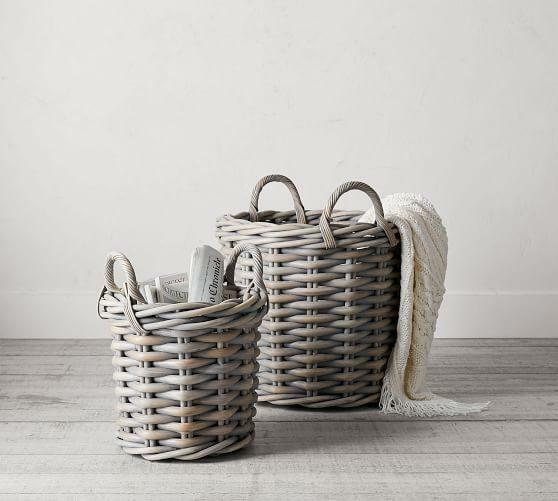 Perfect to hold rolled up bath towels in, the Briar Tote Basket by Potterybarn is a nice way to display your plush, terrycloth towels. Price: $79 – $143. 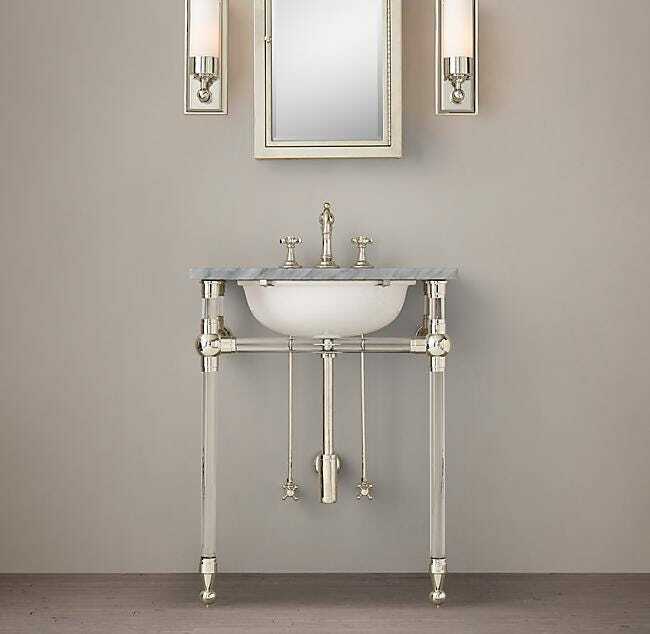 With a handsome combination of polished nickel and powder glass finishes, The Gramercy Powder Glass Washstand by Restoration Hardware offers a refreshing and transitional look. Price: $1,830 – $3,230. 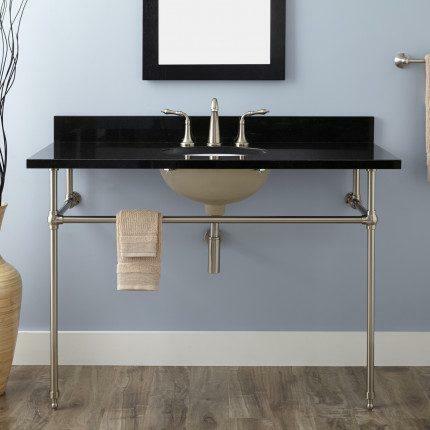 The Mason Apothecary Sink Vanity by Potterybarn will add a clean and cool statement to any bathroom space. Price: $1,099. The Art Deco Undermount Console Sink by Signature Hardware will bring a traditional yet modern look any bathroom setting. Price: $479. 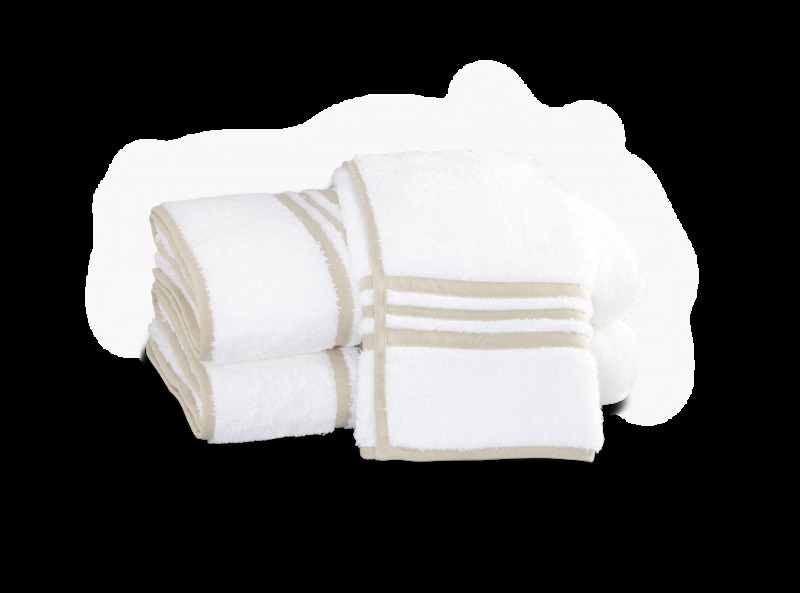 Available in other colorways, the Allegro Towel Collection by Matouk features a triple-band border design and the plush texture of terrycloth. Price: $54 – $225. 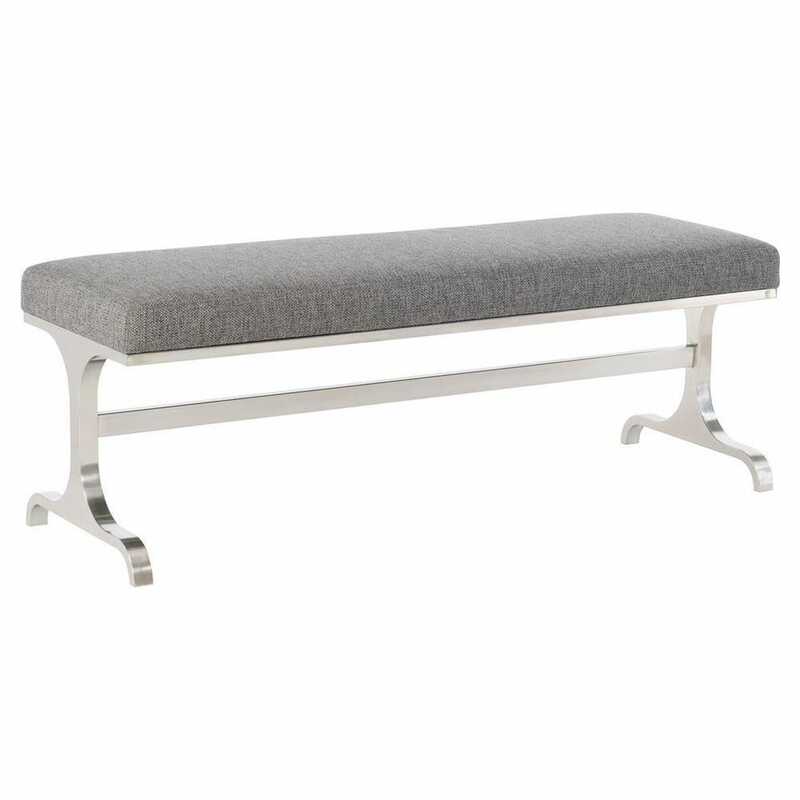 Re-upholstered in a terrycloth fabric, the Dean Modern Silver Metal Bench by Kathy Kuo Home would be a chic addition to any bathroom space. Price: $1,403. 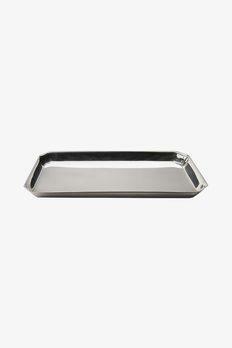 The Asscher tray by Waterworks offers a minimalistic and sleek aesthetic. Price: $125. 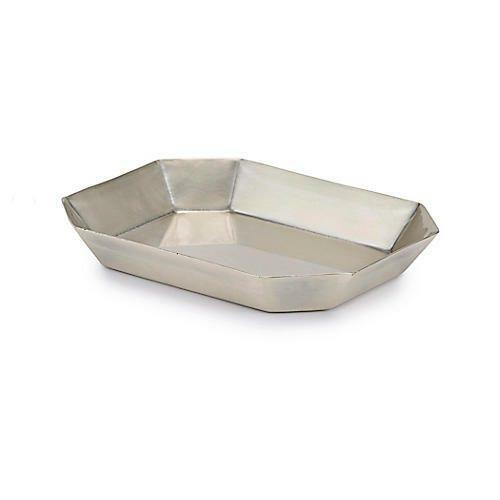 Placed on the countertop of a bathroom vanity, the Nomad Soap Dish Tray by One Kings Lane offers a modern look all while being functional. Price: $17. 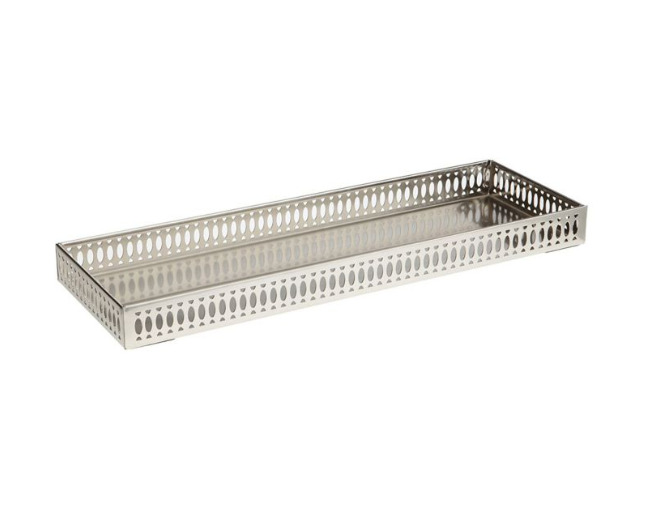 The polished nickel Taymor Fret Vanity Tray by Bed Bath & Beyond is a nice way to display your fine looking care products. Price: $20. 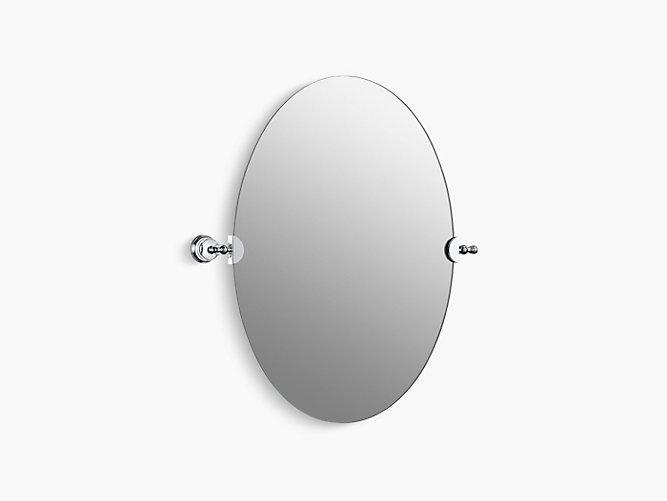 A node to Bauhaus style, the Revival Oval Mirror by Kohler is an elegant option for above any bathroom vanity. Price: $1,003.